Stu (From Scotland | Working in Kyoto, Japan) on 30 March 2014 in Plant & Nature and Portfolio. Lovely and so tender! 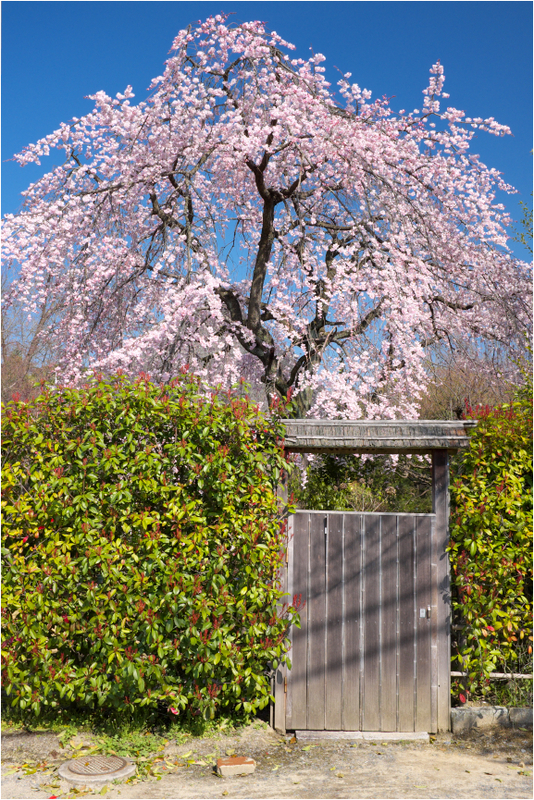 The green bushes with fresh red leaves embrace the gate and the weeping ume was the "crown" on that day....'cause it will go away soon and the gate might succumb to sadness. But for now...I love your "secret garden". I have several such places in the "satoyama" around here. A good presentation of the "happy hour"! such beautiful composition, tone, lighting & atmosphere! Splendid ! Good composition for an explosion of delicate colors. I like a lot the contrast between the wooden door and the surrounding vegetation. Fantastic shot of cherry blossoms under the blue sky. Beautiful. The secret is out. What a lovely cherry tree. Fairy tale image with magnificent composition and light !